As an avid fan of the Rolex British Grand Prix, it was a no-brainer for Tom Matthews to head to the iconic Silverstone circuit for his first race weekend on F1 2018. Launching next Friday, August 24th, we had the chance to get our hands-on with the game early thanks to a review copy provided by the team at Codemasters. 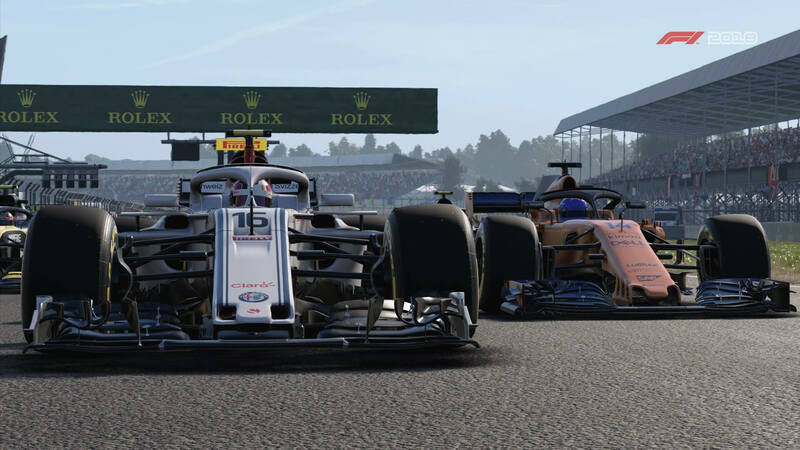 Be on the lookout for our review and more coverage soon, but for now, don’t miss this video highlighting the fan-favourite British track in F1 2018. The result was a surprising, intense 13-lap race with the AI set to expert difficulty. Tom chose to drive for Sauber as Charles Leclerc. There was no practise session, but a short qualifying round did take place ahead of the race. Of course, the ‘halo’ head protection system is in full view throughout the video, and in his commentary, Tom also shares his thoughts on the improved handling and simulation models featured in F1 2018. Additionally, the video includes some cinematic TV-style shots blended with the gameplay, which were captured using the game’s exquisite replay mode. As a reminder, F1 2018 will be available for Xbox One, PlayStation 4, and PC on Friday, August 24th. Not only does it feature all the cars, teams, drivers and tracks of the 2018 Formula 1 season, but there’s also 20 iconic classic cars from the history of the sport, as well as a host of improvements that have been made to the Career Mode – which you can check out for yourself in this 40-minute preview video. For more on F1 2018, be sure to check out our dedicated Game Hub for the title.